Meesha Ghoshal is acting in Vijay's Mersal, directed by Atlee and she shared a few pictures from the shooting spot yesterday (30th July). She took to Twitter to place a request to Vijay fans. She tweeted, "If u all r true fans nd really waiting to watch this movie #Mersal, then kindly pls hav patience nd wait for it to release. Few ppl r Leaking nd talking bout the story. All work goes waste if u ppl will know bout the story b4 release itself.. few want to know wat is it bout. So pls stop sharing such news nd wait for the film to release... don't spread fake news or talk bout the story now itself, kind request. Ystrdy also when i posted the pics, few were trying to b detectives nd looking at the background, talking bout the story.not fair being fans. @actorvijay sir loves u all as much as u all love him nd it feels very sad to c ppl trying to talk bout the scenes n the story of the film. 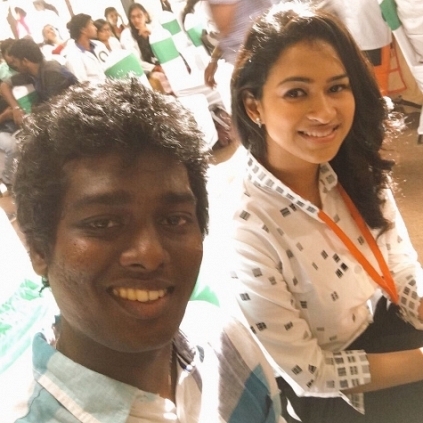 And very sorry if i hurt any1... my intension was just to let u all know nd that's all... thanx anyways"
People looking for online information on Atlee Kumar, Meesha Ghoshal, Mersal will find this news story useful.